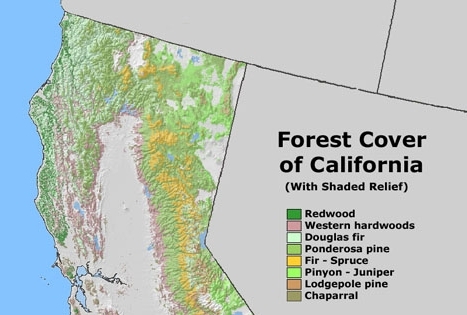 Distribution of Forest Trees in California (Griffin and Critchfield) 1976 (US Forest Service Research Paper PSW-82) (print copy available in Docs A 13.88:PSW-82) Maps show distribution of 86 trees in California. Accompanying notes give elevational limits, geographic relationships of species, and ecological and historical factors. Distribution of the Native Grasses of California (Beetle) Hilgardia 17(9):309-357, 1957 (print copy available in Periodical S 1 H5) Contains distribution maps of 184 grass species found in California. Includes an introductory section on the biogeography of grasses typically found in different floral associations in California. Forest Health Protection Aerial Detection Survey (ADS) Cumulative Map Products (US Forest Service) Identify areas in California’ w here mapped mortality and damage is occurring over multiple years and/or at severe intensities. Maps are available by county and national forest. Forest Visitor Maps (US Forest Service) Maps of all national forests in California. Generalized Types and Age Classes of Timber Stands Redwood-Douglas Fir Subregion, California (US Forest Service) 1978. Shows six types and four age classes in the coastal regions from the Oregon border to Santa Cruz. OakMapper (California Oak Mortality Task Force) Interactive mapper maps incidences of sudden oak death. Timber-Stand--Vegetation Cover Maps (California Cooperative Soil Vegetation Survey) (map G 4361 K2 s31 U5) Series of 467 maps produced between 1948 and 1962 at a scale of 1:31,680 that map timber characteristics in northern California.